Saturday is the day we can express opinions and answer questions to enjoy the wisdom of the masses. 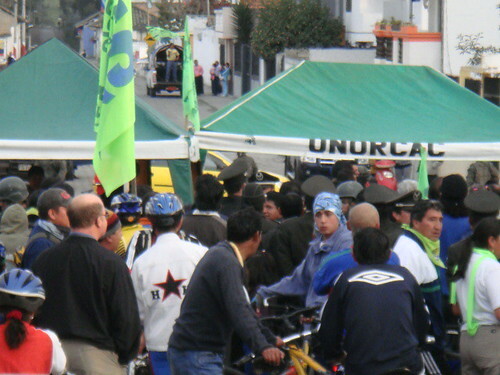 Masses at a political meeting in Cotacachi, Ecuador. #1: How US tax bill affects Americans who transfer money abroad. #2: Ecuador police comments and questions. #3: How inflation is formed. Ecuador politics can be zany at times. Wise? Who knows? But democracy seems to be the best system mankind has found yet. I wonder how much wisdom the masses of US voters exercised this election? I guess we’ll see in the next two years. One thing about all politics is that they almost always follow economics. Politics react to rather than creates global business. So we’ll review an economics story shared in our last Q&A. Reader Question: Gary, I’m a subscriber to your Ecuador Living newsletter. My wife and I are 38 and 42 years old respectively, and have been strongly considering at least a part-time ex-pat lifestyle. Ecuador and a couple other countries in Latin America are on our list of potential destinations. I just received the following note regarding a recently passed piece of legislation in the US. Can you please comment on its impact to folks considering a move outside the US in the next decade? Should a foreign bank/investment account be set up ASAP in advance of the provision of this law mentioned? Should any potential property purchase timeline be moved up in advance of this law? Joe is an extremely experienced tax attorney so if my understanding is correct, there is a bill by this name and number. However it is not related to US persons transferring money abroad. The bill is aimed at encouraging overseas banks… if they choose… to withhold 30% of report income earned at that overseas bank. If the overseas account is already reported and income declared (as it should be) then the withholding won’t take place. #2: Ecuador police comments and questions from article Ecuador police comments. Reader Comment: Gary, do you think that people will still go to Ecuador after what they read? I don’t care how much opportunity is there, life and peace of mind are priceless. Second Reader Comment: I was rather surprised to read your article this morning about the Quito kidnappings and stabbings. I was only in Quito for 2 days so I did not feel any dangers but I guess there are problems everywhere these days and one must stay alert and informed or risk these things happening. Third Reader Question: With the US except for 2 states allowing concealed carry permits, which I possess what chance of giving us some gun laws south of the border that we visitors could use. I know that usually one can transport firearms aboard as cargo in the US but what about to Ecuador, etc? Fourth Reader Question: These “cops” are all young females, none carrying sidearms or even clubs. That kind of presence is not going to deter any crime. My reply to all. Unarmed police are to me a really positive sign as is the lack of guns in a country. I used to love it when I lived in England and the Bobbies never had guns. Now like in Ecuador some police have weapons and some do not. Many security guards also have guns. It is possible but difficult for an Ecuador resident to legally have a gun. I grew up in a Quaker family. Most of my cousins went to George Fox Collage, a Quaker school. I was first married in a Quaker ceremony. This is a pacifist religion. There is a lot of sense in this as in all of nature, predators tend to have shorter lifespans than non predators. No matter how strong one is… fighting in life and death situations requires great energy and increases risk. So if possible I’ll always go out of my way to choose a peaceful path. I grew up learning how to shoot and hunt and all five of my children are good shots and know how to use and be careful with guns. I have plenty of guns in the USA which is a place where there are guns.I do not have a gun in Ecuador nor have I ever felt I needed one. I lived in England for many years and did not ever have a gun there either. As mentioned I prefer police forces who do not carry guns… it makes the police more sensible and reduces aggression though now in Ecuador and in England some of the police have firearms. I feel as safe in Ecuador as in the USA but these things shift which is why we need to stay alert and know where we are and watch for changes in patterns of crime. Not many years ago thieves in Miami were shooting people right off the road and killing tourists in roadside rest areas. I didn’t take a gun to Miami. I stayed away from Miami and out of roadside rest areas. This is why I passed on this mention of increased crime in Quito. I won’t avoid Quito but will be more careful while there AND I will stay as up to date as possible. It is a slow day in the small Saskatchewan town of Pumphandle, and streets are deserted. Times are tough, everybody is in debt, and everybody is living on credit. A tourist visiting the area drives through town, stops at the motel and lays a $100 bill on the desk saying he wants to inspect the rooms upstairs to pick one for the night. The guy at the Co-op takes the $100 and runs to pay his debt to the local prostitute, who has also been facing hard times and has had to offer her services on credit. No one produced anything. No one earned anything… However, the whole town is now out of debt and now looks to the future with a lot more optimism. I then wrote: “This is an interesting story and has a point but I’d like to point out that the hotel proprietor got screwed! He accepted the $100 from the prostitute… forgave the debt and then lost the $100. A number of sharp eyed readers caught me! The only player in the scenario who theoretically came out worse is the unwitting traveler who made a loan i.e. gave up a thing of value which was put at risk and others benefited from, but ultimately he received no compensation (interest) for the loan. My Comment: This reader is correct in that my thinking was wrong. Yet in the end we both missed a key point. The real loser was all consumers. That transaction created inflation… as do stimulus packages. The creation of money (as was done with the $100 bill) without the creation of goods and services, creates inflation. Eventually if this keeps happening in Pumphandle Canada, the cost of meat, hotels and everything will rise! So when the government gets too involved in the economy… always ask the question… who is going to get screwed? And what will the cost be. My guess (and where I am betting more of my money) is that inflation is ahead and during inflation, equities, commodities and real estate win. Enroll in our Feb 11-12 International Investing Seminar and get both report above free… plus an online copy of our October seminar free immediately. Save $378.